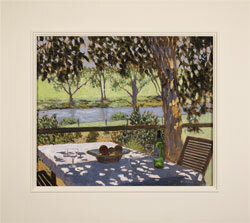 A discerning and highly skilled painter, Mike Hall’s sun-dappled scenes radiate warmth and rustic elegance. Winning a painting competition when he was just eight years old, Mike’s talent and natural ability as an artist shone through from earliest childhood. He studied at Manchester College of Art, before completing his postgraduate studies at the Royal College of Art in London. Before becoming a full-time artist, Mike enjoyed successful careers as first a freelance interior designer and then a film and television set designer. This understanding of interior space is evident in Mike’s paintings, as the home space and the natural world are brought together to create scenes which exude tranquillity. 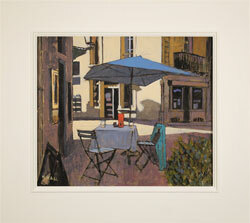 Reminiscent of the blissful and balmy days of late Summer, Mike’s paintings have a restorative and wistful effect. They are tinged yet intriguingly absent human presence. 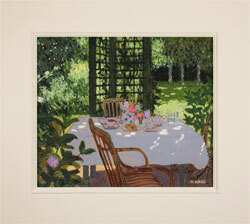 Whether it be a table set for tea in the garden sunshine, a half-read book abandoned on a window ledge or a glass of wine momentarily forgotten in the summer sun, they invite us to create a narrative. 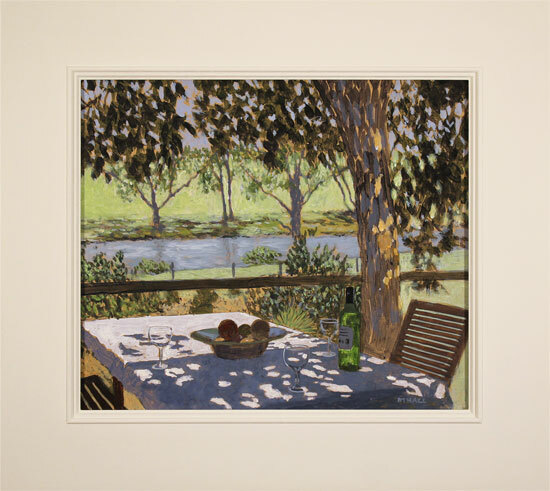 With his art exhibited in galleries around the country and represented in private collection around the globe, Mike’s paintings are both highly regarded and widely sought after.